Enjoy cool and refreshing walks along the banks of the rivers and canals, by discovering of the impressionists routes along the Seine or retracing the steps of dancers in the famous guinguettes by the banks of the Marne. 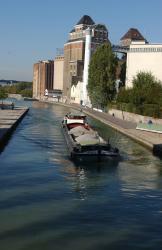 Take a country walk along the banks of the Canal de l'Ourcq : you can walk through the Poudrerie Forest Park, along by the Pont de Flandre lock and the Grands Moulins of Pantin, reminders of a glorious past, or soak up the atmosphere in the former La Villette abbattoirs. Experience the atmosphere of Paris in a bygone age along the Canal Saint-Martin. The mysterious vaulted tunnels, the waterways bordered by chestnut trees, the romantic footbridges and the numerous bars make the Canal Saint-Martin a essential place for lovers of the capital to visit. And for the more athletic among you, the Canal Saint-Denis offers the opportunity for a long skate or bike ride from the bassin de la Villette to the Stade de France along sections of the redeveloped canal banks in Aubervilliers and Saint-Denis.